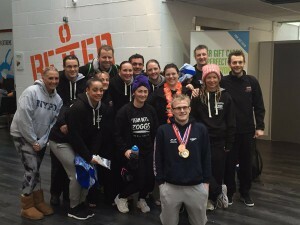 The #TeamBetter Swim Challenge took place from Thursday 25th February until 1st March when the team of 13 each swam 31 miles in 6 days across the UK and NI, all in the name of raising money for Sport Relief. #TeamBetter travelled around 31 Better Leisure Centres from London, all the way out to Belfast and up to Carlisle and the North, finishing back in London. #TeamBetter was made up of GLL employees from lifeguards to Aquatics Managers, alongside Olympic and Paralympic athletes and employees from our partners; Zoggs, SRS Leisure and H2Open Magazine. The team have raised over £14,000 so far, with money still coming in. If you would like to donate to a fantastic cause, then please click here. Thanks to all our supported GLL Sport Foundation (GSF) athletes that motivated us along the way. We had athletes join us for a mile, or provide vital moral support. 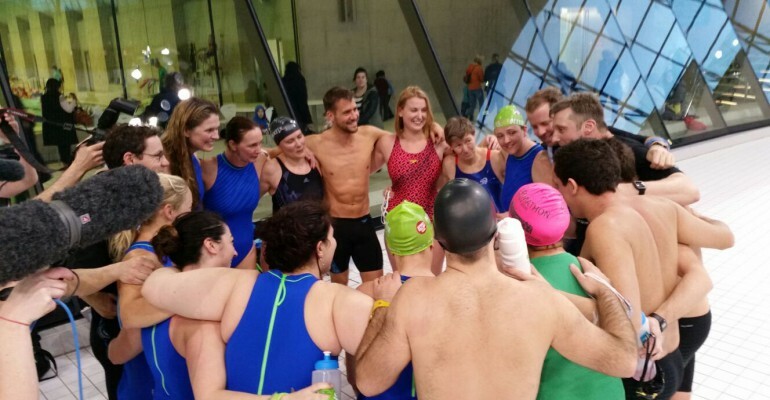 This helped motivate #TeamBetter until the end, with a great finale at the London Aquatics Centre on Queen Elizabeth Olympic Park. Each day #TeamBetter created a Storify, where you can see a summary of tweets and photos from the day. It’s a great way to see how the challenge from start to finish and what happened along the way. Please click on the links below to see each day’s story. 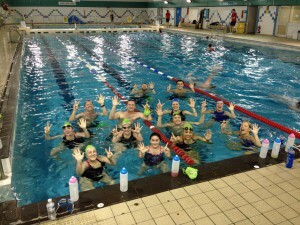 7am-8am – The first leg of the Swim Challenge took place in Barnet Finchley Lido, North London. It was an early start for the team, but that didn’t stop GSF athlete and GB wheelchair racer Justin Levene coming down to support. 10am-11am – Next up was Waterfront Leisure Centre in Greenwich, where two Greenwich Starting Blocks athletes came down to support. Simon Randerson of the GB Transplant Swim Team, in addition to Para swimmer Joseph Peciuch who swam the mile with the team. 1pm-2pm – Crystal Palace National Sport Centre was the next centre that was visited by #TeamBetter. GB Para Swimmer Susie Rodgers came down to support the swimmers on this leg. 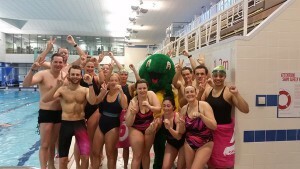 10pm-12am – #TeamBetter flew out to Belfast and had a late night swim at the Avoniel supported by GSF Ambassador Michael McKillop. 9am-10am – GB Para Athlete Michael McKillop joined the team again in the morning for mile 6 at the Grove Wellness Centre alongside Swim Ireland junior swimmers, before the team flew back to England to continue day two. #TeamBetter travelled around the North on a tour bus, eating and sleeping in between pools for days two, three and four. Day two consisted of Carlisle, Cockermouth and finishing up in Manchester Aquatics Centre. support this leg of the challenge. 5.30pm-6.30pm – With a quick turnaround, #TeamBetter made it over to the Vale of White Horse Leisure and Tennis Centre. Mile 13 was supported by GB synchronised swimmer Emma Critchley. 3pm-4pm – Just over half way, the tour bus travelled to Henley and down to Bath in the South West throughout the morning before making its way back up to The Link Centre in Swindon. Thanks to Craig Harris, GB Para Swimmer for coming down to support mile 17. 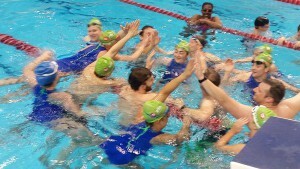 7pm-8pm – Making their way back towards London, #TeamBetter’s next stop was at Rainbow Leisure Centre in Epsom & Ewell. GSF Ambassador and GB Para sailor Alexandra Rickham came down to support and received the fantastic news that she had been selected for the Paralympic Team going to Rio for Sailing – congratulations! That news certainly helped motivate the team through mile 18. The penultimate day consisted of London Better centres. The team travelled all over London using the tube and buses, shaking a Sport Relief bucket as they went. At least point the team had raised around £12,000 collecting money via Swim Hat Challenges, online sponsorship and bucket shaking throughout the challenges and on their travels. 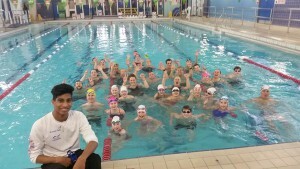 The last swim of the day was in Oasis Leisure Centre in Camden, where #TeamBetter were joined by Olympic Gold Medalist Duncan Goodhew who gave a masterclass. The final day took #Team Better all over London again, from Tower Hamlets, over to Wimbledon, Clapham and Islington, finally finishing at the iconic London Aquatics Centre. The team got an extremely warm welcome on their final leg, with many other staff members joining in the swim for the last mile. Rio hopeful and GSF Ambassador Aimee Willmott, former GB swimmer Stephanie Proud, and Olympian and Splash ITV judge Leon Taylor all joined in the last mile to encourage #TeamBetter to finish with a bang! The current fundraising amount is £14,098, with a target of £15,000. If you would like to donate to help to transform people’s lives across the UK and the world’s poorest communities, please click here. It was great to get so much support from our GSF athletes along the way and #TeamBetter are truly grateful to all those athletes that came down to the centres – it’s much appreciated and they couldn’t have done it without you!